A photography club; some pros, some amateurs, some real beginners. Learning, socializing, sharing and caring are some of the reasons for our getting together. 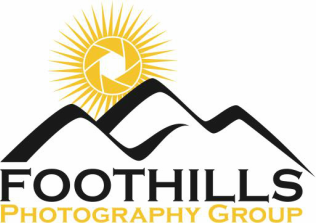 You have landed on the home page of Foothills Photography Group - a fairly new club that's attracting photographers of all skill and experience. The club's first meeting was on January 20, 2015, and was very well attended and since then it's been a very successful first year. We meet every third Tuesday at the Photography School at North Georgia Technical College in Clarkesville, GA.
We welcome ALL levels of photographers: From just beginning to seasoned professionals. Most of all, you will be with others in this area who are interested in photography. Each month we will hear a speaker/expert in some field of photography. This first year the programs have been absolutely amazing. Field trips, group shoots, demonstrations, people helping people (the Mentor Program), discounts on photo gear, and even opportunities to do community service -- these are just a few of the benefits of club membership. We welcome new members. If you would like to join us please click on the Membership tab above and download the membership application. If you have questions or comments you can use the comment form below. I hope to see you at a meeting soon!